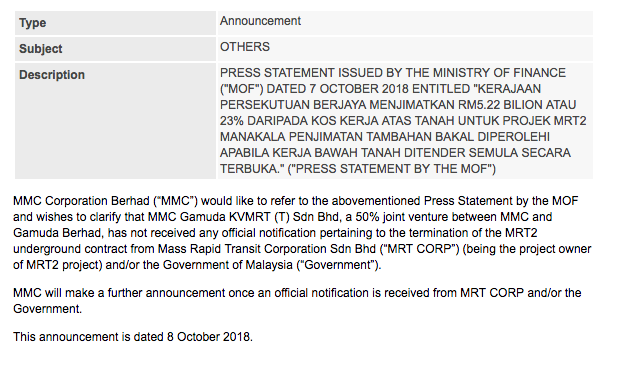 When the government announced the termination of MMC-Gamuda being the contractor for the underground portion of the MRT2, it obviously came as a surprise - as it shows that this government can really terminate contracts. As an investor, it does not appear comfortable for me as where do we trust. When one invests into Gamuda as an example, it is obvious that their contracts in hand (or book order) is one of the largest determinant towards deciding the investment. I am sure, its largest shareholder does have the similar information as we are - and we hope it is that way. The new government, when in power promises us one thing. Go by contract and rule of law. We have yet to see that they are not going by the contract as any contract can be terminated and they have not mentioned anything with regards to compensation. Compensation, however does not console the ones whom they feel they may lose their jobs because of this. We know for sure that it is not the incapability of the JV between MMC-Gamuda in delivering the project but for it is because of the need to reduce costs. However, I am perplexed over why then they do not negotiate until both parties come to an agreement? Usually, that is the spirit as in any negotiation especially towards company which is dependent on government projects, the one holding the trump card is the awarder. Or could it be Gamuda has been arrogant as they feel that they are the only one who can do the job in Malaysia as it does seem that way. They have mentioned it as well in a 4-pager explanation as announced in Bursa's webpage that in the event it is opened to international companies, there is none others that have the capabilities to bid from within Malaysia - not IJM, WCT, UEM etc. It is because Gamuda and MMC only have the capabilities of such extensive tunnelling work, it seems. Ironically, the other 50% partner being MMC announced the below - lacking the detailed explanation, unlike Gamuda. Gamuda it seems is the only one which is more vocal and it also seem that they are the one that is affected most. If one is to ask around, people are more confident of Gamuda's engineering capabilities when comes to this. Rarely, one would mention MMC. There is obviously more than that, which one could not help to think of. Hence, cronyism came into mind. In my observation, Gamuda does not seem to be the one that seems to be the crony. It seems that the other company - MMC - is more of the concern here. If Gamuda is the crony, it would not have been awarded the Penang Transport Masterplan project where it holds a 60% JV stake. That project was awarded in 2015 when the current Minister of Finance, Lim Guan Eng was the Chief Minister of Penang. In fact, until the recent change of government, the project faced great difficulties to commence - from getting approval from the federal to getting financing. Now, this announcement of termination came from the MOF although it is mentioned that being the Cabinet's decision. Najib Razak today, pointed the top 30 shareholders of Gamuda and in the list the largest shareholders are EPF, KWAP, PNB and many other funds that invest into Malaysia. Why not? As in any companies that depend on government contracts, they need to be friendly, but we know that they need to be that. We however do not have complains of their deliveries. In my mind, Gamuda is a quality company, hence the diversified investors. In fact, this is the type of shareholder composition we want among our top listed companies - not the ones which PNB, EPF, Khazanah are the controlling shareholders - where they hold more than 30% to 40%. MMC - It seems is the other type and Najib may have pointed onto the wrong company. We know who Syed Mokhtar is. Contracts monopolies etc. From Bernas to Pos Malaysia to Proton to port businesses. He also owns Penang Port and probably caused difficulties to some people. To my concern however is not on Gamuda the stock, but my bigger concern is Gamuda the business and company that it has built itself to be. I have always believe that we need to build our Malaysian companies. Gamuda is one of such. It is capable of delivering what other large companies such as Hyundai, Chinese state companies can deliver - tougher projects - tunnelling. Do it in Malaysia and then overseas - compete there. I thought the pitch that has always been provided so far is about building our Malaysian capabilities. This is why there is keenness to have our 3rd national car - I thought. Hence, as a Malaysian, I feel that the government has to revisit the termination. Renegotiate again but try not to give this kind of projects to another Chinese or Japanese company. I know they perhaps can be capable or even cheaper but this is not what we have been voting for.